Peterborough boss Graham Westley - pic: Joe Dent. Hatters boss John Still praised the impact that Graham Westley has had since taking over at Peterborough recently. 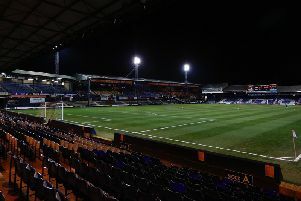 The former Preston and Stevenage chief took over at the ABAX Stadium after Dave Robertson was sacked, and has won nine of his 13 matches so far, scoring an impressive 37 goals in the process. Still has clashed with Westley over the years in their respective dugouts, but on meeting again this afternoon, the Luton boss said: “Graham has his critics, maybe he doesn’t please everyone, but I always put managers into two categories. “One of them is how you are, and one is the job that you do and he did a very, very good job at Stevenage and he’s doing a good job so far at Peterborough. “People will go on about the job he didn’t do if you like when he went to Preston, but it’s not always going to be great all the time. “He’s a good, hard working, knowledgeable football man, personalities to one side, that’s what he is. “I admire anyone who does this job as it’s a tough job and I admire anyone who is in this job as long as he’s been in this job. Meanwhile, ex-Peterborough striker Craig Mackail-Smith believes the appointment of his former team-mate Grant McCann to the backroom staff has played a part in the resurgence too. He added: “He’s (Westley) done really well. People have got their preconceptions of him, but he’s gone in there and I’ve heard the boys really like what he’s doing. “I think the big thing is they’ve got Grant McCann there. I’ve played with Grant and I know how good a player he was and how good a coach he is. “I can see what parts of their team, the way they play, the way they pass the ball and the way they tackle, that I know he’s had a big influence on that.